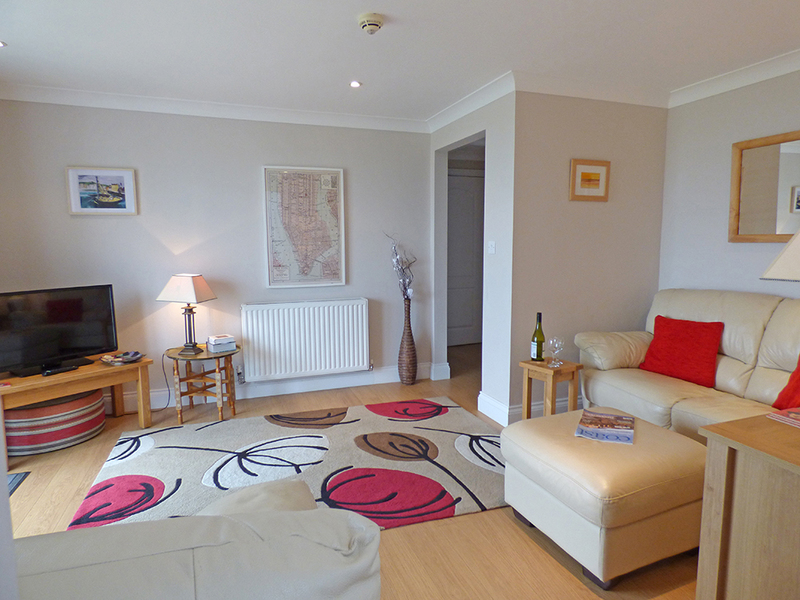 The James Braid Suite is a delightful, ground floor, contemporary apartment, set in an envious position on the Newport Links Golf Course and offers one of the most stunning views over the course, beach, estuary and out to sea - you will be mesmerised. 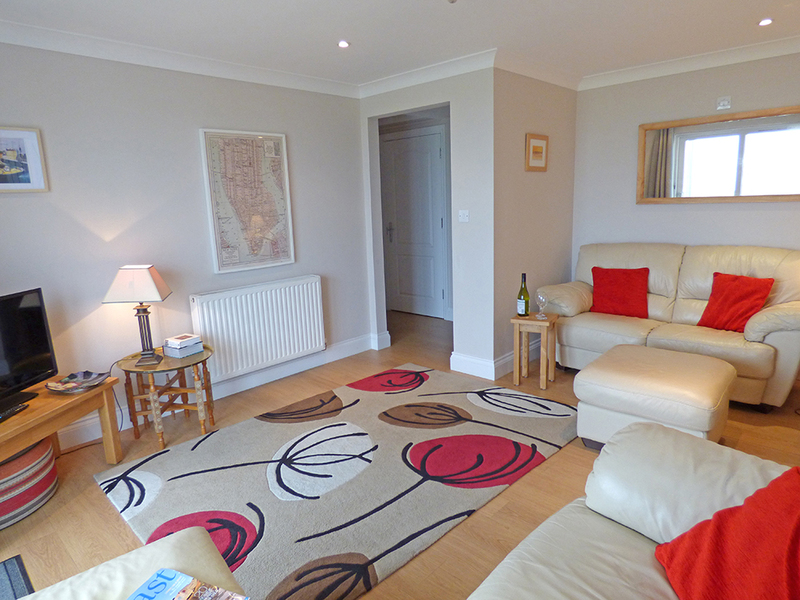 Furnished to a high standard with wooden floors, the open plan living space has a modern, fitted kitchen and comfortable sitting area to relax, patio doors lead out to your own paved patio and lawned area, all offering the same glorious sea views. 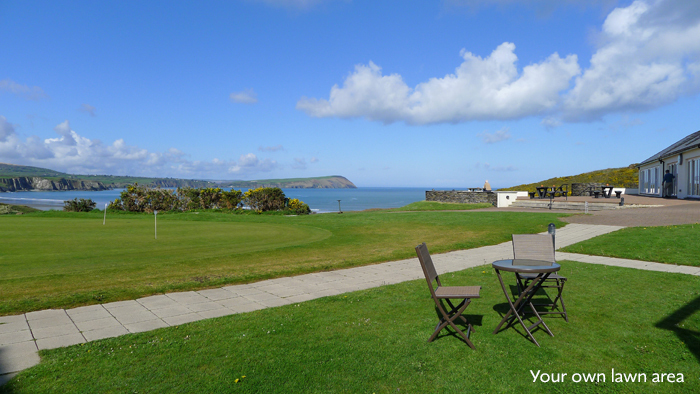 Enjoy an alfresco meal on your patio, while you soak up the ever changing aspect or alternatively spoil yourself and visit the club house, highly recommended for food (limited mid week off season opening hours). 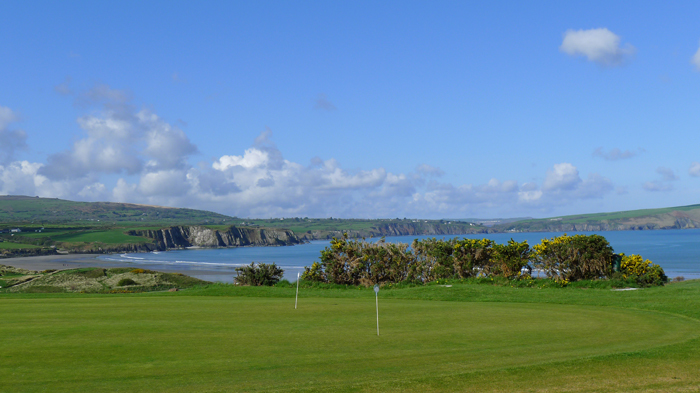 Perfect for keen golfers, preferential rates are offered for guests or spend your days exploring the Pembrokeshire Coastal Path right on your doorstep, walk down to the beach or discover the stunning, rugged coastline. The bustling town of Newport, with its range of pubs, restaurants, shops and galleries are all within walking distance. A wonderful holiday base, whatever the season. No cot and highchair provided, you are welcome to bring your own. 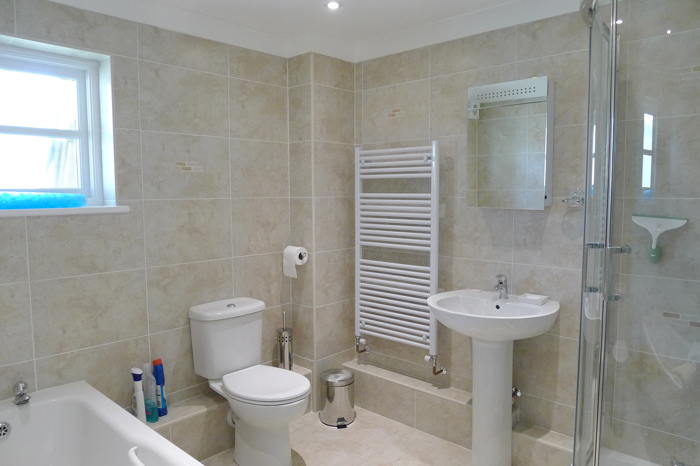 Ground Floor: Hall, open plan lounge/kitchen/diner, bathroom/shower cubicle/whb/wc, twin room, twin room/ensuite shower/whb/wc. 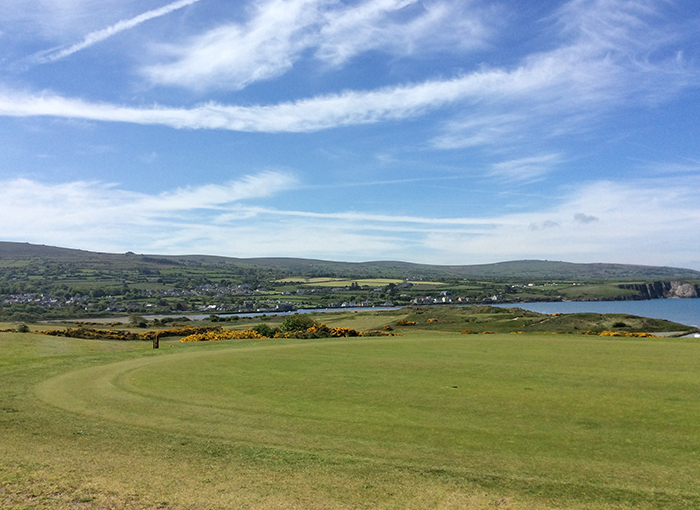 Parking: 1 designated space, additional spaces in golf course car park. 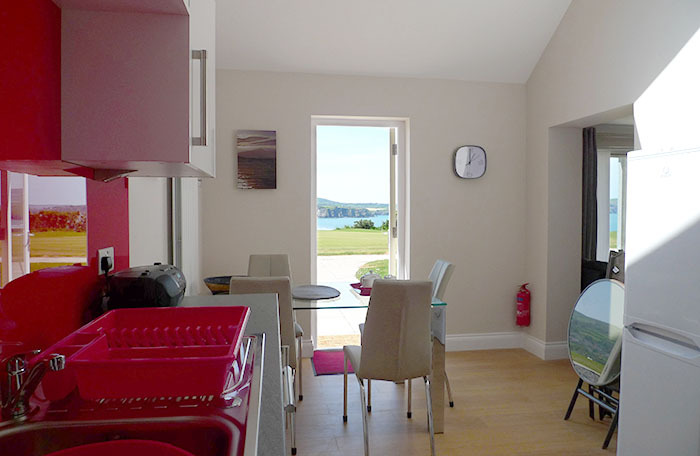 Facilities: Electric oven and hob, microwave, fridge/freezer, dishwasher, washing machine, tumble dryer, TV, DVD player, WiFi, telephone - incoming calls only, towels, patio furniture. The street market in Newport runs from the beginning of April to the end of December. The market is open on Mondays, weather permitting, from Its aim is to promote and sell local produce and products and it presents an opportunity to buy fresh produce and locally reared meats. Only place in Wales where you can see candles dipped in their original way. Inger John provides a warm welcome to all visitors, who can see hand-dipped candles being made without any mechanical aids. Her candles are created with unique graded colours and with exotic scents including specially blended essential oils. The workshop is a real “Aladdin's Cave” packed with candles of all shapes and sizes. Most are made on the premises, and others are imported from all over the world. Also in stock are candlesticks of many types, snuffers, lanterns, oil burners, accessories, candle-making kits, and books of local interest. The Witches Cauldron, or Pwll-Y-Wrach to the Welsh, is a geological feature near to Ceibwr Bay which can be accessed only by either sea kayak or a good half an hour walk along the Coastal Path from Ceibwr Bay. A collapsed cave which gives stunning views to those walking and kayaking in the area, and lots of intricate tunnels seen only by kayakers. Access is denied during the autumn when seals gather to pup, and the walkers path is steep and narrow in parts. Situated in North Pembrokeshire, Castell Henllys is an extraordinary day out for anyone interested in history. With a reconstructed Iron Age Hill fort, Castell Henllys is set in 26 acres of woodland on excavated remains from over 2000 years ago. Particularly interesting is the three large replica roundhouses, the granary and forge. 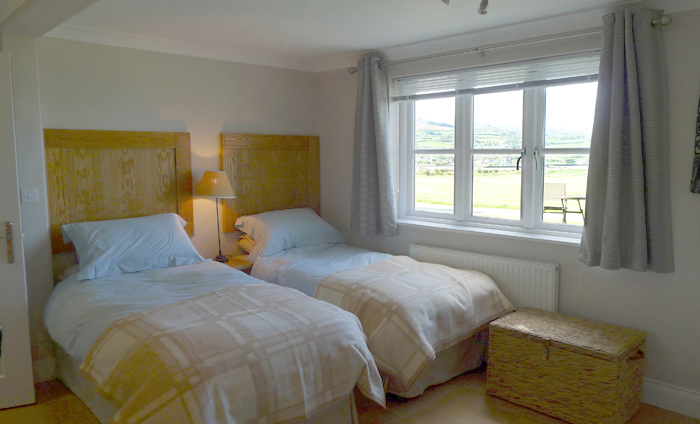 Dyfed Shire Horse Farm, Eglwyswrw a tourist attraction at the foot of the Preseli Mountains. They are known internationally for breeding a shire horse called Major Mercury (aka Dyfed Celt) one of the household cavalry drum horses. There is plenty for the whole family to do, whatever the weather. Daily Timetable of activities including, Harnessing demonstrations, during which we will dress the horse in a working set of harness and explain the function and history of the harness, Horse and cart rides (Summer Holidays Only) Tractor ride around the working farm, Animal Feeding and Donkey Grooming. They also have an Indoor soft play area & Outdoor adventure area - Crazy Golf, Sand Shed and Skittles. Nature Trail with woodlands and hedgerows to explore and stunning views of the Preseli Mountains to enjoy. Please Note: Dogs are welcomed but must be kept on leads and there is a small charge for their entry. A superb long stretch of beach with lots of room to play games and sail boats. 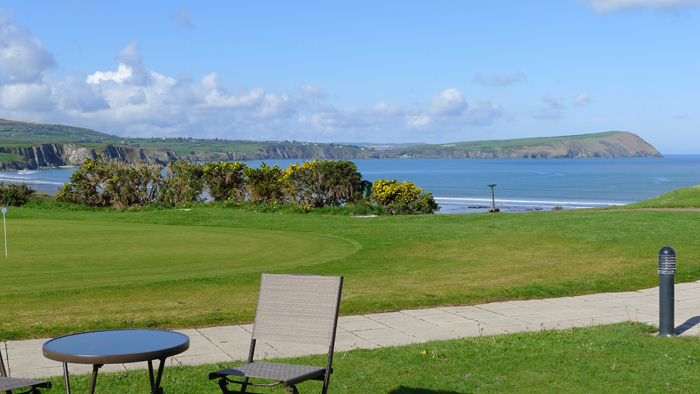 The beach is backed by a popular golf course with club house. At low tide you can walk across the estuary to Newport Parrog, and the walk around the river bank through a bird sanctuary to the road bridge crossing is always enjoyable. Visitors should be careful of dangerous currents around the river. Nature has given Newport a spectacular setting of sea, castle and the towering Carn Ingli – at 1100-feet this makes for a wonderful view from the beach. Access to the beach is easy – no steps or cliffs. This large, picturesque horseshoe shaped bay is generally well protected from the winds and waves that pound much of the Pembrokeshire coastline. The historic town of Newport stands near the mouth of the River Nevern where there are 2 beaches - one on each side of the estuary. The Parrog is on the Southern side, and although this is the more sheltered beach, unpredictable currents make bathing dangerous. However, the area is rich in prehistoric sites, including Pentre Ifan burial chamber. To find the beach follow the signs from Newport and the A487. It is dog friendly all year round. Ceibwr is an attractive little bay, totally undeveloped and the haunt of shy seabirds and Grey Atlantic seals, with the nearby village of Moylegrove within walking distance. The cliff walking is high, craggy and awesomely beautiful whatever the weather or season. The cliffs show evidence of impressive forces at work circa 400 million years ago when Ceibwr was created - admire the elegant folds and scrolls in the rock face. The ruins of a fine Celtic fortress can be found on the northern cliff edge. The more romantic can envisage the smugglers taking advantage of such a remote spot along with the ideal locality of the cave on the beach. 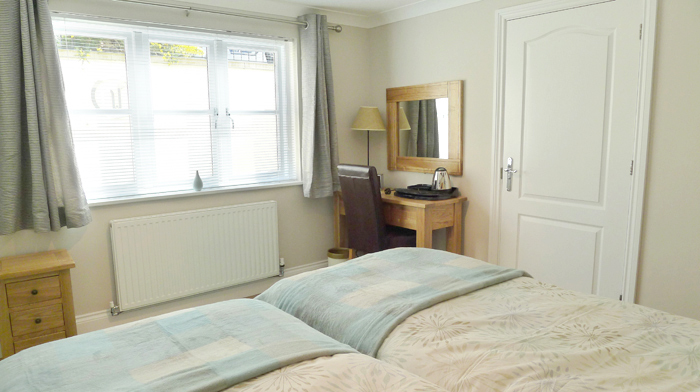 This area is for those seeking a quiet holiday near the amenities of Cardigan and Newport but away from the more popular sandy beaches and busy centres. There is a car park with toilets in Moylegrove and roadside parking closer to the cove with space for approx 20-25 vehicles. 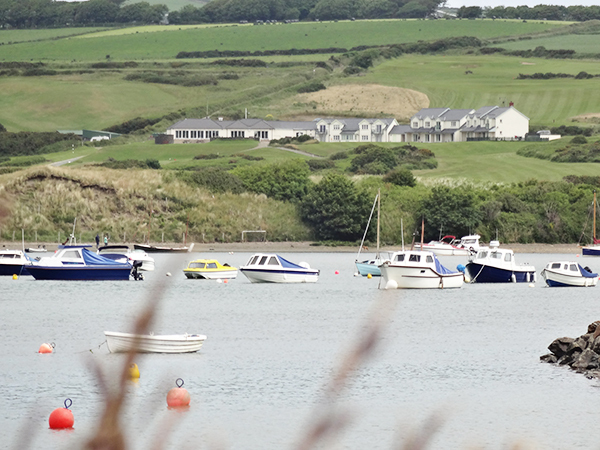 Near the mouth of the River Teifi, on the southern side opposite Cardigan, stands St Dogmaels. It is essentially a seafaring village, as examination of headstones in the churchyard will testify. The remains of an Abbey founded by Robert Fitz-Martin in the 12th century are worth a visit. Poppit Sands a little further down the estuary has a beautiful and extensive beach which denotes the start (or the end!) of the 186-mile Pembrokeshire Coast Path. 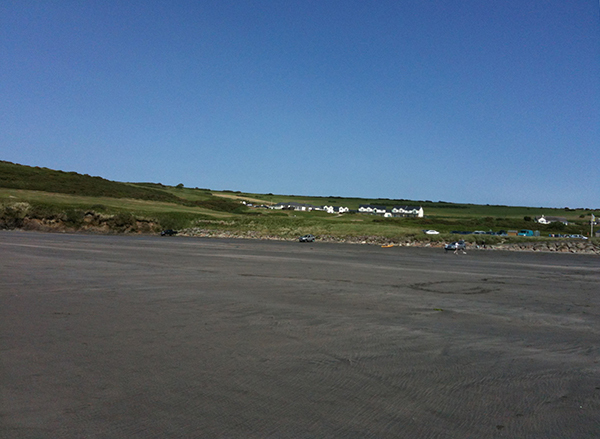 Poppit Sands is a sandy beach, backed with sand dunes at the mouth of the Teifi Estuary. It is the beginning, or end, of the Pembrokeshire Coast Path. The proximity of the beach to the town of Cardigan has made it a very popular venue for visitors, but bathers should be aware of dangerous currents and heed the warning signs and lifeguard flags. It is a blue flag bathing beach making it an ideal holiday location. Lifeguards patrol the beach between July and August from 10am to 6pm each day. Dog restrictions apply to a section of the beach between 1st May and 30th September, but the rest of the beach remains dog friendly. Morawelon is Camping and Caravanning site with a on-site restaurant providing campers and visitors with delicious hot and cold food. 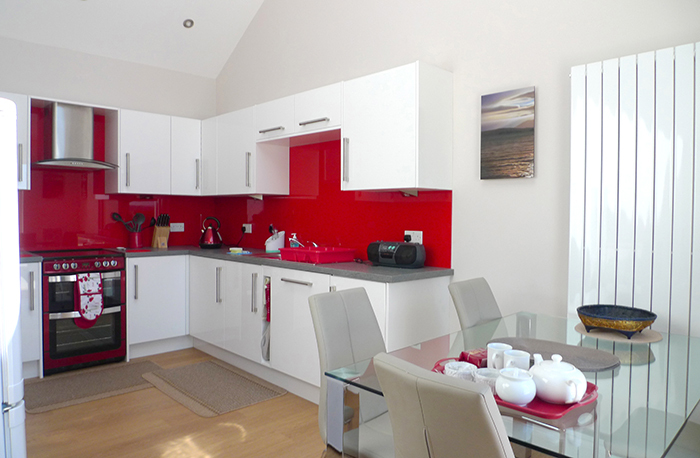 A waterfront location with extensive views across Newport Bay and Morfa Head. Its family-run,so you can be sure of great service and top quality cooking from healthy and tasty ingredients. A superb range of teas, coffees and pastries also available all day, with a fully licensed bar. With it's constantly changing menu, and a wide selection of home-cooked food they can cater for everyone's needs. 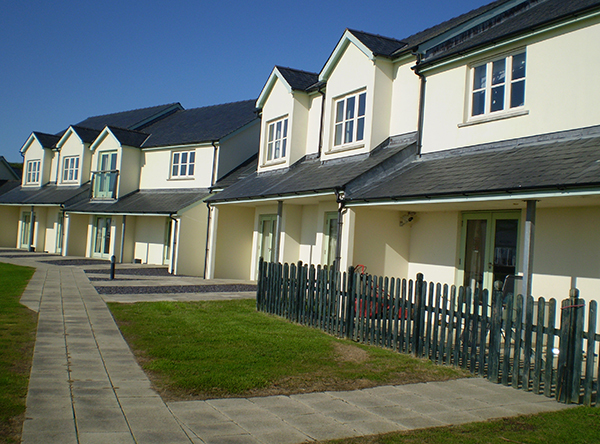 Llys Meddyg is a typical Georgian town house which has been transformed into a luxurious place to visit. The food and drink options range from the more elegant fine-dining menus to family friendly menus, as well as offering seasonal menus throughout the year. Cnapan's restaurant will instantly make you feel at home with its relaxing and friendly atmosphere. The food and drink menu celebrates local produce with Welsh beef and Preseli lamb (to name a few) being part and parcel of Cnapan's everyday menu. If you're looking to spoil yourselves with some quality food and drink, Cnapan is the place to go. The Golden Lion makes the most of the local produce available, with Welsh beef and freshly caught seafood on their doorstep, you're guaranteed to be impressed by their menu. Specials vary according to seasonal produce. The Trewern Arms and hotel is a 16th century building, situated astride the banks of the River Nevern. It's a typical cosy country pub with stone walls and original beams. This riverside pub is situated in the Valley of Nevern making it a rather rural and secluded pub, with fishing off the river just across the road and popular woodland walks nearby. Food varies from pizza to burgers, from steak to fish - all made with local produce. Originally established in the 16th Century, The Salutation Inn brings together a mix of modern and traditional with a welcoming atmosphere. Their lounge bar serves typical bar snacks whilst their restaurant serves three course meals and is also available for private functions. The Freemasons Arms is on the main road at Dinas, conveniently situated across from a car park. This pub offers a range of ales and meals at both lunchtime and in the evening. They have a beer garden, with a darts and pool room separate from the bar. 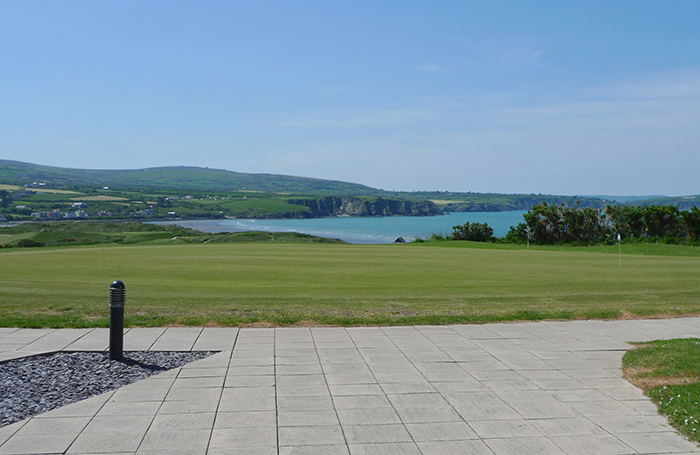 Seaglass Restaurant, is located in the grounds of Newport Sands golf course, relax with spectacular views overlooking the bay and golf course perfect for a leisurely breakfast, relaxed lunch or delicious dinner, everyone is welcome.We extend a warm welcome to families, groups and couples. By day relax and enjoy our unique beachfront setting with our wonderfully light and airy ambiance. The restaurant enjoys panoramic views of unspoilt Newport Bay from inside the dining room with floor to ceiling windows and from our sun-filled terrace.Children are very welcome and we have a children’s menu with all their favourites. 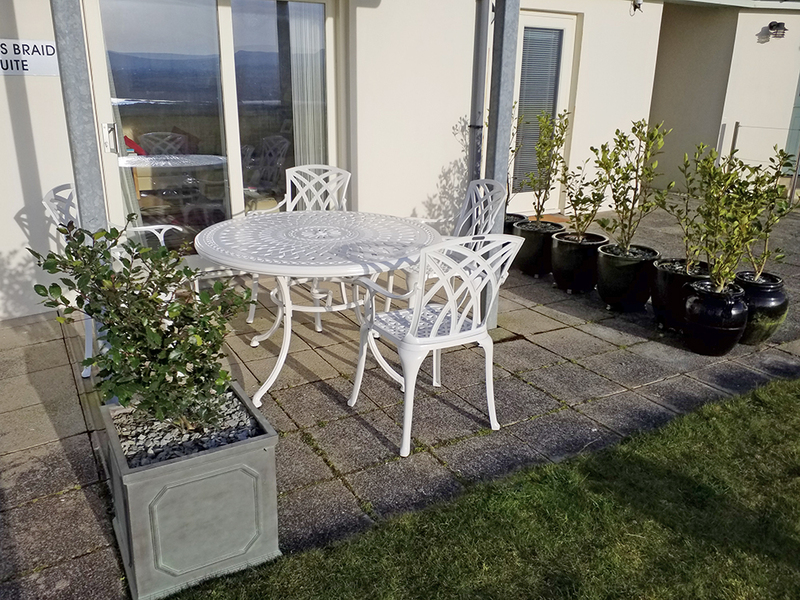 Youngsters can enjoy our play area whilst the adults relax and take in the view. In the evenings our stylish and contemporary decor offers intimate and sophisticated dining. Fresh and seasonal produce is prepared daily with care and served with attention to detail by our expert team. Whether it’s a warm, hearty pie made from local, seasonal ingredients, a delicious toasted Panini, fresh Moules Marinieres, or indulgent sticky toffee pudding we have something for everyone. A family run club house that dates back to the late 13th century and offers home made meals, traditional Sunday lunches and refreshing drinks including locally brewed ales. The Country Club is a tranquil park which has an abundance of trees, flowers shrubs and gardens which are maintained to a very high standard. 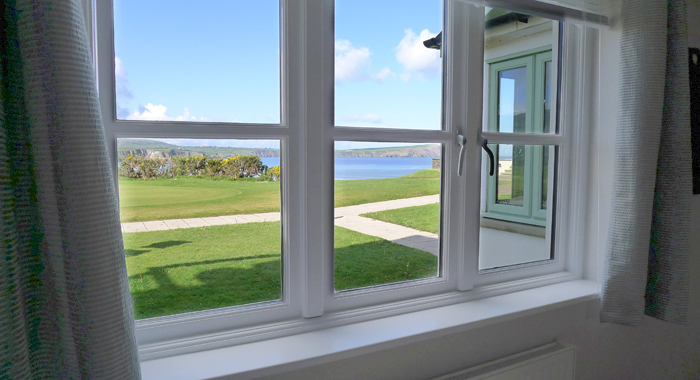 The sea views from the park take in the beautiful landscape of Dinas Head and look north all the way to the Llyn Peninsula on a clear day. Please Note: Table bookings are advisable. Formerly the Sailors Safety, this pub/restaurant dates from 1593. It is named for the light it once kept burning as a guide to ships. 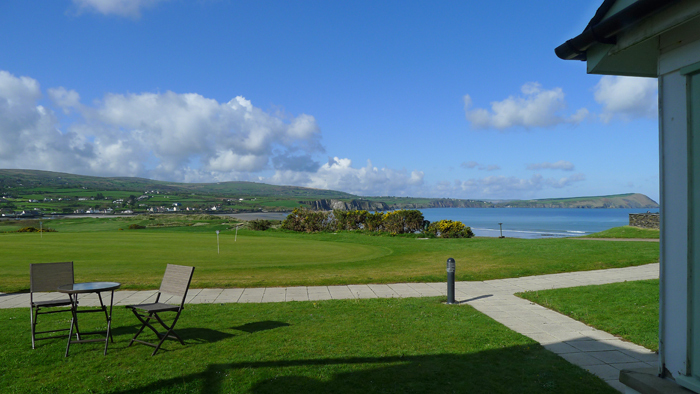 Set in a beautiful location where you can view spectacular sunsets, The Old Sailors restaurant stands on the beachside at Pwllgwaelod. A wide selection of local seafood is on the menu daily, with the local crab and lobster a must for all seafood lovers. For those with a more traditional taste there is a fantastic homemade Steak & Ale pie. A fine selection of local beers and fine wines available. St. Dogmael's Abbey was founded on the banks of the River Teifi in 1115 for Tironian Monks, before being given the status of Abbey in 1120. Fortunately there are extensive remains to visit today, original 15th Century floor tiles can still be seen along the nave of which the west and north walls stand nearly to their original height. The Coach House is set in the surroundings of the Abbey ruins, and is now home to a museum and visitor centre where they have a collection of carved stones that were once part of the abbey on display. Adjacent to St. Dogmaels Abbey and alongside a mill pond, this is one of the last working water mills in Wales which produces a range of stoneground flour. Set in the Eastern Preselis, Foel Drygarn (also known as Foel Trigarn) can only be accessed via a footpath, however there is nearby parking. It is the remains of a large Iron Age Hill-fort covering almost 4 hectacres, with three defended enclosures, and three large cairns each three metres in height. Historians state that it is likely to have been a heavily populated fortified village which was built sometime between 650BC and 100AD. Cardigan Castle is a magnificent castle which boasts some 900 years of history. It was once captured by Rhys ap Gruffudd who hosted an Eisteddfod, has been visited by King Edward I and Henry Tudor, it has been subject to burning leaving it partially demolished, before being purchased by Ceredigion County Council in 2003 and undertaking serious renovations enabling it to open its doors to the public as a heritage attraction in 2015. Cilgerran Castle is situated in a stunning location overlooking the Teifi with two massive round towers still standing today. This was first established by the Normans as a ringwork castle and is approximately 800 years old. Entry to this castle is free during the winter months, and is free all year round to National Trust Members and the disabled. Please Note: Dogs must be kept on leads. A great place to stay in such a lovely area. Newport has several really good places to eat too- an added bonus. Beach walks along sands and estuary are a must we feel. Be sure to get some beautifully scented candles from the little candle studio up in the hills. Best apartment we have ever stayed in at the Golf Club! 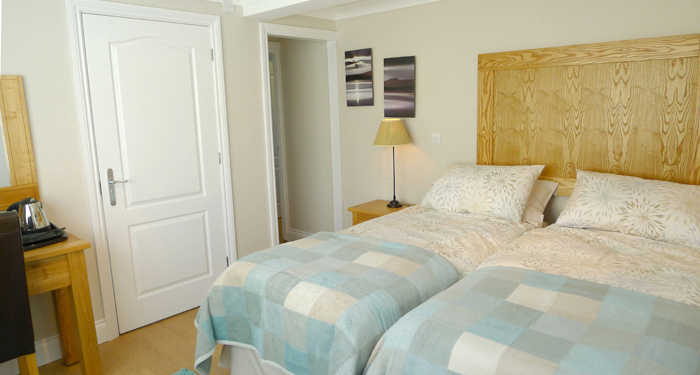 Accommodation very comfortable and a great place from which to explore this dramatic landscape. Some great walks in countryside that hasn’t changed for centuries. Fabulous apartment, with wonderful views. Our best Newport stay in 19 years. Clean, all appliances working, well laid out. Thank you. A marvellous 'bolt hole' for a winter break. Amazing apartment, so well equipped. We ate in everyday! Even the weather was kind to us. Super views. Thank you for a relaxing break. Fantastic apartment. Wonderful position. Always something to look at. We had wonderful weather and apartment was lovely - Many thanks for a great week. Approach from A487 about 2 miles down a country lane. 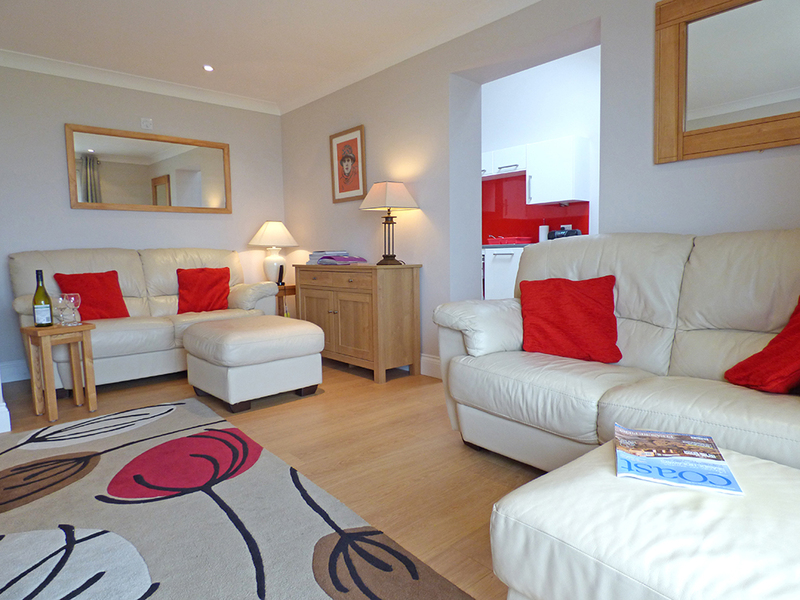 The property has one allocated parking space with 6-8 steps down to the main entrance door. Alternative single level access is available through 2 sets of double doors leading to the other side of the property. 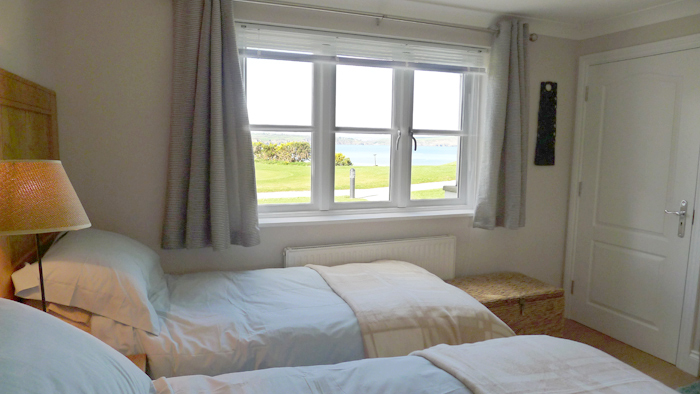 Patio doors open onto a small private grass and patio area (not fenced off) which overlooks a golf course and the impressive beach. 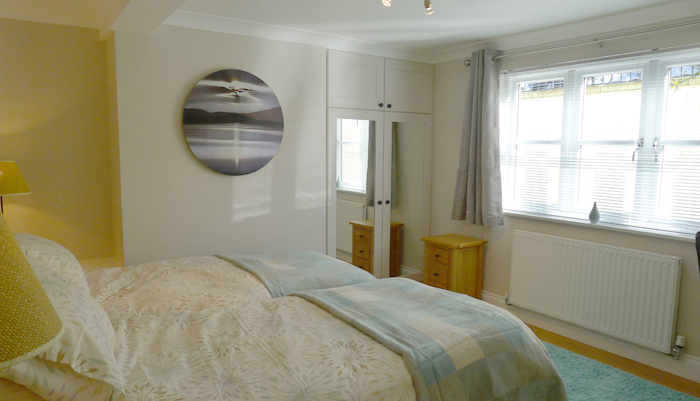 All facilities are on the ground floor and include, 2 twin bedrooms, 1 bathroom and 1 ensuite shower room, hallway, living and dining areas and fully fitted kitchen. Both bathrooms have showers (neither suitable for wheelchair access), one also has a bath (with a standard 300mm access to the room). 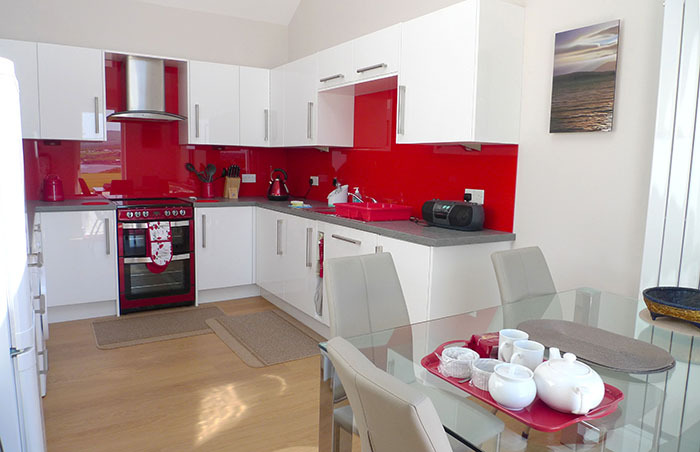 The kitchen has extensive worktops, free-standing electric cooker with ceramic hob, dishwasher, washing machine and tumble dryer. The lounge and kitchen have spectacular views and both are well lit. External lighting on both sides of the property is automatically activated at night time. Local bus runs daily between May and September and twice weekly the rest of the year. How would you like to contact us about James Braid Suite?